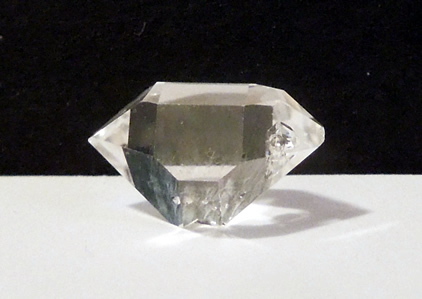 There are many interesting phenomena to this natural (raw) AA grade quartz crystal. First one notices the sharp double termination points (tips). 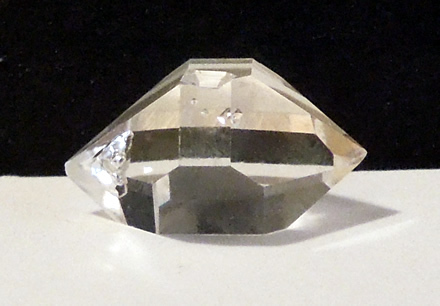 Because Herkimer's formed in a matrix rock of dolostone, the quartz did not adhere to the host rock, but rather repelled from it. Another smaller crystal did form against it and left behind it's imprint in the form of a geometric key mark. The key is seen clearly in the picture above, and it's reflection shows in some of the other images. Also seen in the picture above is a clear bubble like inclusion, it lays just below the surface. It reflects more strongly in the pictures than in person. 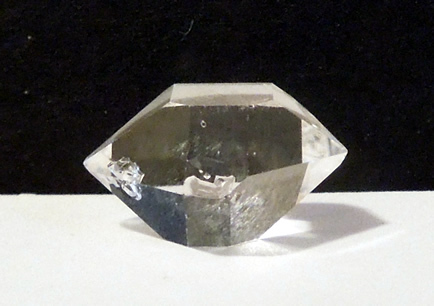 A teeny seed crystal is found internally as well, only with a loupe can you see it's double terminated as well! 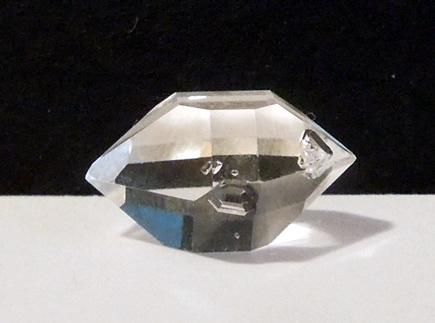 The size of this Herkimer quartz crystal is fairly large for AA grade. 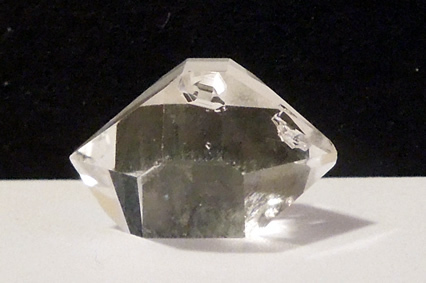 Our grading process finds less than 5% of Herkimer's mined are AA grade quality. Of these 5 in 100 natural gemstones, maybe 1 or 2 is 12 mm (½") or larger. Clarity, of course, is excellent. The fine AA grade quartz crystals purchased from us are guaranteed to be in their natural, or raw form. That is to say, none of them have been touched up or polished by machinery in any way. What you purchase is what Mother Nature created over 500 million years ago !